A look at the impact of gentrification on older residents in Vancouver’s Chinatown. For nearly a year the group has been working on the food blog, sharing recipes and personal stories online. 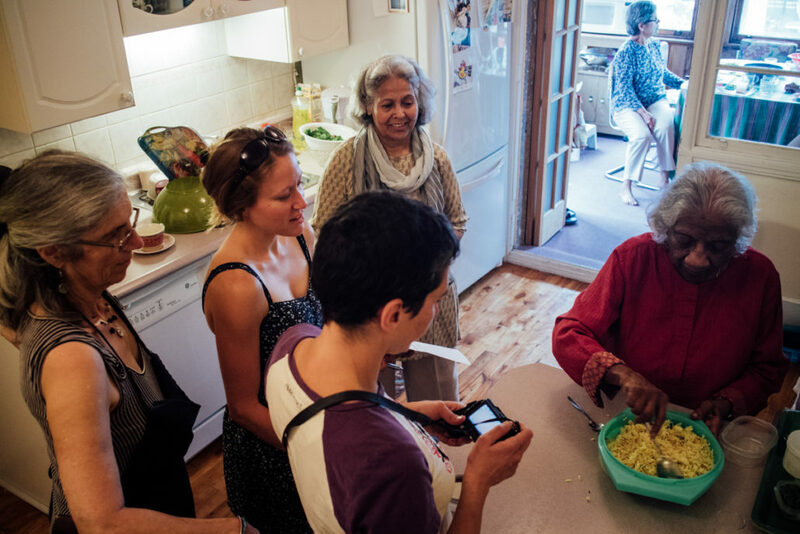 These stories offer both contextualization for their recipes and what they signify for RECAA members, as well as a means of raising awareness around the issues older adults encounter in daily life. 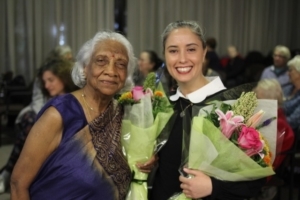 The project received funding from a New Horizons for Seniors grant from the Canadian Government, and ACT, as a collaborator, also provided funds and support through workshops that focused on developing digital skills. RECAA members have developed and practiced photography, filming, and blog writing skills through the experience of cooking and sharing food. Myriam points out that gaining visibility in an increasingly digitalized society becomes easier for older adults when they have the skills needed to engage with the world digitally. Blog posts are not just about recipes, but include observations and thoughts on a variety of social issues. A recent entry recounts RECAA member, Marguerite’s experience working at a food bank in France. After having read an article on the CBC website, the group discussed concerns around food accessibility, in particular those of older adults. While the number of people who visit food banks is rising across age groups, ethnicities, and classes, older adults are the most vulnerable. Not only do they experience increased chances of poverty, but often lack the infrastructure to access healthy and affordable food. Whether poor public transportation systems or an absence of ramps, older adults face a host of challenges and obstacles to achieving food security. It is here that Myriam found one of the most interesting developments: “As a group of primarily older women, they are changing their relationship with food from one that is based on caring for others, one of nourishing children and family to one that is empowering.” Their connection to food is being reconfigured from one that represents familial life to one that performs social and political activism using a digital platform. To record recipes RECAA members have cooking sessions facilitated by Myriam and ACT research assistants, Antonia Hernández and Magdalena Olszanowski, where they practice their photography and filming skills while recording measurements and steps of the recipe being featured that week. They also interview the person in charge of the recipe, so that when they meet next they have the material to produce a blog post. 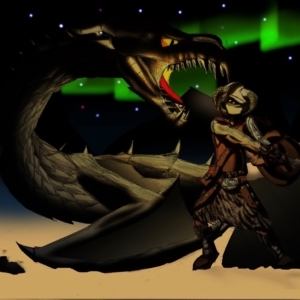 They have visuals as well as stories and thoughts about the recipe. These cooking events have begun to extend out into different communities as well. In February, in honour of Black History Month, RECAA shared a lunch with community members of Union United Church, Canada’s oldest black congregation. It was an opportunity to share experiences of living in the city, as well as learn about racism in Montreal. The lunch created a space for RECAA and the congregation to exchange and share, and become community partners. Myriam’s Ph.D. research is engaged in thinking about the ways in which discourses on food and diet engender practices and conceptions of the body. With the emergence of a biomedicalized food culture, she examines the ways in which the contemporary body becomes a semiotic body and a medium for connecting a multiplicity of discursive, material, disciplinary, and institutional elements. When asked what she has learned in the project, Myriam said that the group has offered her the means to develop a critical eye for the knowledge produced about food through various discourses. She says that the joy of cooking and eating the members of RECAA share is far more important than having recipes that calculate protein or fat. That the ways in which the the group relates to food is more embodied, it is about pleasure and the experience of eating together. It is about responding to a discourse that does not acknowledge the political, cultural, and social dimensions of food. It is about discovering the potential food has for activism and learning. This month’s In Focus piece brings an overview of an EU-funded research project on ageing and technology; one that approaches the topic from a health perspective, with a specific focus on dementia. 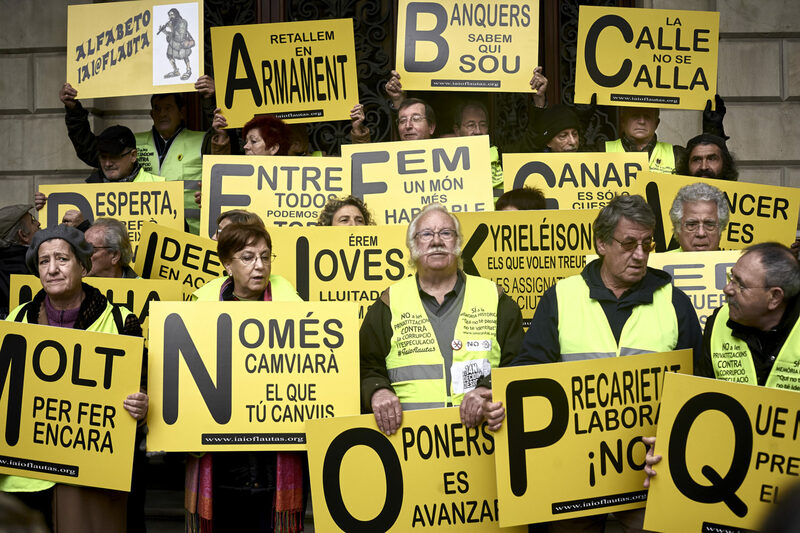 The Iaioflautas in a demonstration on January 2013 (photo by Fotomovimiento under a CC BY-NC-ND license). With this text I intend to share some reflections regarding the perception of stereotypes of older people, and how these are confronted by older adults who are highly active in political protests, in adopting information and communication technologies (ICT), and in continuous collaboration with younger generations. These reflections come from a broader case study about a social movement led by older people that emerged in Barcelona in late 2011 called “Iaioflautas,” which in English can be roughly translated as “flute grannies,” in solidarity with the defamatory appellation against young hippie squatters, “Perroflautas” (“flute dogs”). It has become common to think about older people as engaged voters and thus more politically involved than younger people. Studies have suggested that in some European countries older people seem to participate more than younger people in elections (Goerres, 2007; Quintelier, 2007). However, not many people envision older people’s political participation within social movements, in the form of protests, demonstrations, sit-ins, blockades, and other non-institutionalized ways of participating in the political sphere. Scholarship has mirrored this trend as there has been limited research conducted on older people’s involvement in political activism and protest activities (Adler, Schwartz, & Kuskowski, 2007), with some notable exceptions (Sawchuk, 2009; Narushima, 2006). Portrayals of older adults as unskilled and as problematic ICT users are also widespread and common (Loos, Haddon & Mante-Meijer, 2012; Fernández-Ardèvol, & Ivan, 2015). Fortunately, research has challenged this perception demonstrating that age per se is not the decisive factor for ICT dexterity, but rather, it acts in conjunction with several other factors (e.g., ICT experience, socioeconomic status). The appearance of “Iaioflautas” as a new social movement is characterized not only by being composed largely by older people, but also by their active use of ICTs for organizational and communicational purposes. Mireia Fernández-Ardèvol and I decided to examine this group in the hopes of contributing to knowledge about older adults’ participation in what has been termed “networked social movements” (Castells, 2012). The participants’ perceptions of ageist stereotypes and their use of ICTs within the movement were two of the aspects our study examined. Through a series of 15 semi-structured interviews with politically active participants, we found that most of the interviewees shared negative stereotypes of older adults held by younger people. Some of the most common perceptions cited in the interviews were that older adults are regarded as a burden, stubborn, aloof, selfish, or unproductive. The last notion, that older adults are unproductive, was most notable, as society seems to value older adults only as long as they remain active, autonomous, productive, and engaged in society. This belief seems to be implicitly supported by some participants, who were critical of their age-peers not protesting in the streets with them. The majority also reported feeling praised and encouraged by others when engaging actively in protests. Yet, even when they do so, they are scrutinized and questioned. One participant remarked: “When you go out, ‘disguise’ yourself, and do what we do…you’re a freak! They don’t understand. ‘What is that person thinking?’ ‘But Sir, at your age?’” So, on the one hand, older people are valued only if they participate actively in society, and on the other, are judged as acting inappropriately for their age. All participants in the study have a mobile telephone and nearly all of them communicate regularly and consistently through Internet via emails, social media, and apps. The data collected from a non-representative online survey that we codesigned with colleagues (Tecnopolítica, 2014) indicates that of a subsample of self-reported participants in Iaioflautas aged 60 and over (n=13), 9 participants (69%) used a computer (desktop, laptop) and 11 (85%) used social network sites to access and share information about the protest movement. Facebook (85%) and WhatsApp (54%) were the most common digital technologies used during their participation. Moreover, 73% of these Facebook users and 71% of these WhatsApp users reported having used these technologies for the first time during their participation in the movement. In other words, their involvement in the movement also meant an introduction to new digital technologies. Our interviews revealed that participants learned to use these technologies through two distinct pathways: either forced by their daily commitments – work, family life, social participation – or facilitated by courses organized by the movement itself. The latter was particularly relevant for blue-collar workers, either working or retired. A participant explains: “We organized a couple of short courses on computing because they had no idea what Facebook or an email were. Now, they are loving it. They are with their email, Facebook, Twitter all day long, which is great! But they had no clue, 80% of them.” Although not representative of the older population in Spain, the data assisted in debunking the notion that older people are unable to learn and master new technologies as a consequence of their age. While this study addresses what might be understood as a minority within a population, it is important to remember that only a relative minority of people, young or old, becomes involved in social movements activities. Our findings challenged the social perception of older adults as problematic in the adoption of new ICTs. We found that as long as older adults understood the adoption of new technologies as beneficial, their interest in learning increases, and they can become as intensive users as younger people. Iaioflautas offer us a good example of how ageist stereotypes can be combated: via greater intergenerational interaction and collaboration, wider training opportunities on ICTs, and fairer portrayals of older people in the media and popular culture. This might not be enough, but it helps in building greater social cohesion between older and younger people, a relationship that at times appears to be under stress. Daniel Blanche is a PhD student at University Pompeu Fabra in Barcelona and a Research Assistant for ACT, involved in coordinating the Telecommunication Technology research stream of the project. While there are no objectively clear distinctions between states of health, improvement, enhancement, optimization, or wellness within these discourses, they are ubiquitous in the proliferation of ‘neuro’ commodities (e.g., brain-stimulants and exercises), ‘neuro’ knowledges (e.g., neuroethics, neuro-marketing) and other ‘breakthrough’ enterprises at the frontier of cerebral subjectivity. When working with elders, it’s important to have a particular sensitivity to their life experience, their knowledge, and the ways in which they have been systematically and systemically excluded from the cultural production that requires ‘new media’. This ‘new media’, that is everywhere around them. From October 14 to 16, 2016, the third annual ACT meeting took place in Castelldefels, Catalonia, Spain. This year, it was the ACT partner IN3 at the Open University of Catalonia (OUC) that welcomed the ACT team. Some 35 ACT members, including co-applicants, collaborators, community members and students, travelled from North and South America, Europe and Asia to participate in the meeting. Over the past few years, the format of the meeting has been rather consistent: we meet for three days and hold a mix of presentations and discussions, all of which tend to be colloquial and informal in tone. Researchers and community members who have been funded in the past year by ACT are invited to present, briefly, on their work. This makes up the bulk of the three days. The idea behind this approach is for projects to be presented at whatever stage they may be, so as to cultivate an awareness of the projects that are newly in the works at ACT. Sometimes, ideas and rough plans are brought to the group for feedback. Researchers also present results and share publications. 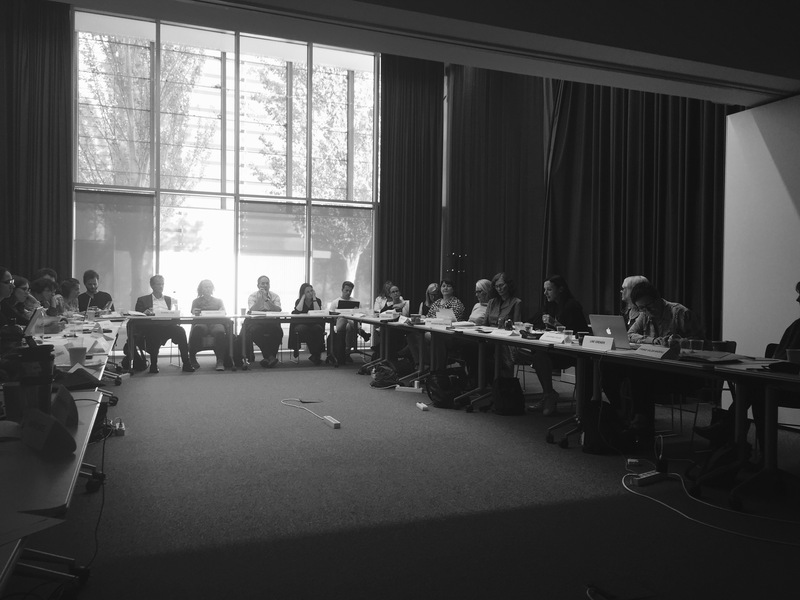 Updates the ACT activities in Montreal, the goings-on of the working groups, and the unfolding of the ACT-sponsored summer schools like the Women Ageing Media (WAM) Summer School and the Graz University Summer School Seggau (GUSEGG) are presented. Since receiving funding in 2013, ACT has organized a public talk each year and invites a keynote speaker. To connect with the host locale, ACT also extends an invitation to the local university community to join the ACT group for these few hours (Montreal and Castelldefels) or combines the meeting with a local event (Bucharest). Over the last three meetings, keynote addresses have been an opportunity to build up the profile of ACT and ageing studies in our respective locales, to meet and exchange with researchers outside of the group, and to give us a collective opportunity to engage with and react to an in-depth research presentation. This year, the UOC organizing team invited Professor Feliciano Villar from the University of Barcelona. His presentation centred on the concept of generativity in later life, with an emphasis on how this concept operates within the context of Spain. 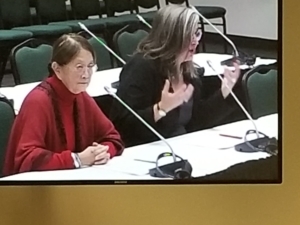 As Professor Villar argued, generative ageing is one way to question current discourses on ageing, including positive, successful and active ageing, a position that sparked a lively discussion and debate. During the meetings, and to ignite debate, discussions are organized on specific topics that the ACT Governing Board has selected. This year, two themes were identified: one on representations of age and ageism and another on quantitative methods. Inspired by the WAM Manifesto and at the instigation of local organizers, another conversation identified the need and desire to write an ACT manifesto for conducting non-ageist or age-aware research. The idea was received with enthusiasm and a working group of seven researchers from Canada, Finland, Spain, the UK, and the US was immediately formed. At the end of each day, even when we are all tired after hours of presentations and discussions, we often find ourselves still eager to spend time together. The students, Grannies on the Net researchers and the Governing Board all hold meetings to hash out research ideas and make future plans. We share meals, and sometimes, when the conditions are just right, we dance. Over the past few years, we have tried to develop a meeting formula that is representative of what we want ACT to be. We seek to be intellectually rigorous, critical and productive in intervening in a multiplicity of discourses on ageing, communication and technologies across disciplines. We also seek to be inclusive, to valourize a diversity of approaches and frameworks, and, especially, to foster a membership that is happy to spend time together, develop shared goals, and work collaboratively within the ACT project. Perhaps one of the most salient markers of the success we’ve had in regard to the latter point has been the emergence of collaborations at meetings that continue to feed our activities for the next year. One just needs to listen in on a few conversations at dinner or during the breaks to see this in action: people express interest in joining projects and in replicating or adapting them in their settings. Others people are eager to borrow pedagogical tools or to invite a fellow ACT member to give a workshop or keynote. Ideas for ACT panels and guest talks are pitched. Working groups, journal issues, and books are plotted. Some of these ideas seem speculative one year, then we find out that they have come to past the next. ACT is indebted to the enthusiasm and organizational prowess of the hosts of the 2016 meeting. Daniel Blanche, a PhD student at UOC who has been working with many of us since before ACT came to be, has put countless hours in the organization of this ACT meeting. Adrien Semail, a MA student at UOC who is a recent addition to the ACT team, did a similarly outstanding job. Finally, we are grateful to ACT Co-applicant and Director of the Telecommunication Technologies stream, Mireia Fernández-Ardèvol, who offered to host this meeting and who welcomed us all so warmly. 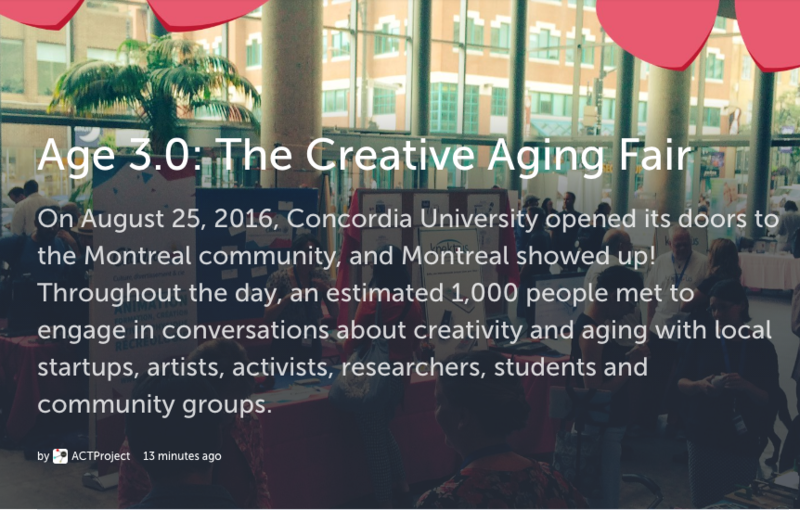 This month’s InFocus piece highlights the events of Age 3.0: The Creative Aging Fair. Earlier this spring, I met up with my dad as he finished hiking the final kilometres of the Bruce Trail, which is a 900 km trek through South-Central Ontario. As a master’s student with a background in leisure studies, I was curious to learn about my dad’s decision to hike this strenuous trail and to know why he decided to do it now, in retirement.